RTE R1′s Morning Ireland today reported on pharmaceutical company GlaxoSmithKline’s links with Sligo Institute of Technology and its plans to expand its Stiefel plant in Co Sligo (above). GlaxoSmithKline, in its previous incarnation Burroughs Wellcome, was the company which carried out vaccine trials on children in care homes throughout Ireland in 1930, 1932, 1934, 1935, 1961, 1965, 1971 and 1973. Its 2009 decision to close the Stiefel Laboratory was reversed in 2012 following the return of records relating to the trials by the Child Abuse Commission. In 2010 the Oireachtas Committee on Health and Children requested these records from Glaxo Smith Kline, which indicated that although prepared to hold the records for the foreseeable future, it would not hand them over without a court order. A timeline of the known medical trials conducted on children in Mother and baby homes in Ireland, the response of successive health ministers and the contemporaneous expansion in Ireland of the medical companies involved in those trials. 1930-5: Burroughs-Wellcome trials (“the 1930-35 trials”) of the APT (Alum-Precipitated Toxoid) vaccine for diphtheria carried out on 2000 children in residential institutions. Stage 1 of the trials took place in 1930 and include 405 children in residential institutions in Cork City, most likely the St Joseph’s Industrial School for Boys, run by the Presentation Brothers, and St Finbarr’s Industrial School for Girls, run by the Sisters of the Good Shepherd. Children taking part in Stage 1 suffer severe adverse reactions. Stage 2 of the trials takes place in 1934 and includes 320 children from residential institutions. Again adverse reactions are recorded. Stage 3 takes place in 1934 and involved 250 children from an unidentified institution for boys and Stage 4 takes place in 1935 and involves 360 children from St Vincent’s Industrial School, Goldenbridge, St Joseph’s School for Deaf Boys, Cabra, and St Saviours’s Dominican Orphanage, Lower Dominic Street. 1961: Burroughs-Wellcome trial of the effectiveness of the polio vaccine when added to the three-in-one (whooping cough, diphtheria and tetanus) vaccine carried out on 58 children in residential institutions only one of which (Bessborough, Co Cork) is identified. 28 of these children receive the proposed quadruple vaccine, with 30 getting the separate three-in-one and polio vaccines. The study concludes that there is a lower polio antibody response in those given the quadruple vaccine, and that it may, therefore, be less effective. Sixteen of 25 infants from one home develop vomiting, diarrhoea and fever after their second immunisation. Their symptoms last a few days before complete recovery. Some 36 infants from both groups are subsequently identified as having an inadequate polio antibody response, and receive booster doses. There is no further follow-up of the children involved. 1965: Trial of a ‘five-in-one’ vaccine carried out on Philip Delaney at Bessborough Mother and Baby Home, Cork. 1971: Burroughs-Wellcome trial (“the 1971 trial”) of intra-nasally injected rubella vaccine carried out by Burroughs Wellcome on 69 children in unidentified residential institutions. 11 children with no rubella antibodies and one with receive the intra-nasal vaccine, while six others without antibodies are used to monitor whether the vaccine virus was transmitted. There is no follow-up. 1973: Burroughs-Wellcome trial (“the 1973 trial”) of a modified three-in-one (diphtheria, whooping cough and tetanus) vaccine is carried out on 53 children (including mentally and physically handicapped children) in residential institutions in Dublin (St Patrick’s Home, Madonna House, the Cottage Home, the Bird’s Nest and Bohernabreena), all of whom receive the modified vaccine. The trial also includes 65 children living at home, 61 of whom receive the original vaccine. Some of the residential institutions mistakenly believe that their residents are getting the original vaccine. 1977-1984: Following concerns as to the safety of the three-in-one vaccine generally, then Health Minister Michael Woods sets up an Expert Medical Group (“the Expert Medical Group”) to deal with applications by persons alleging to have been brain damaged by the three-in-one vaccine. There are 93 applicants, 16 of which were offered ex gratis payments with 77 applications being declined. It is not known whether or not any of the applicants included children who had formed part of the 1973 trial or indeed whether or not the Expert Medical Group considered the 1973 trial at all. 1979: Construction of new £1.25 million Wellcome Ireland Limited factory in Tallaght commences. 1981: The Irish Times reports that since 1975 the Wellcome Foundation has donated £240,000 to Irish veterinary research. 1992 :Supreme Court decision in Best v Wellcome, a case successfully brought by Kenneth Best for brain damage caused by a batch of the original three-in-one vaccine. 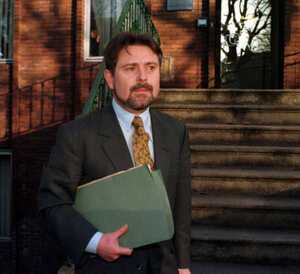 Chief Justice Liam Hamilton found Burroughs-Wellcome to have been negligent and awarded Best £2.75 million. 1993: The then Minister for Health Brendan Howlin, through his private secretary, writes to a former resident of one of the homes used in the 1973 trial, stating that the Department of Health had inquired and was satisfied there was no added risk whatsoever to the children who received the vaccines. It iremains unclear whether or not Mr Howlin was referring to the inquiry carried out by the Expert Medical Group, which as stated focused on the three-in-one vaccine generally, or a separate inquiry. 1995: Burroughs-Wellcome merges with Glaxo to form Glaxo-Wellcome. At the time of the merger Burroughs-Wellcome employs 30 people at its Irish distribution centre in Tallaght. Glaxo employs 100 people at its manufacturing facility in Rathfarnham. It also carries out packing, distribution and some research activities at its Dublin plant. Glaxo’s Irish operation records an annual profit of just under £2 million. 1997 :As a result of an investigation by the Irish Independent, the involvement of children in residential institutions in the 1973 trial is made public for the first time. In response, the Department of Health states that all affected persons who had requested information had been provided with a full copy of their files by the Expert Medical Group in 1977-84. However most if not all of the institutionalised children part of to the 1973 trial – even if aware of having been subjected to the vaccine – would have been too young to have made an application to the Group during this period. 1998 Minister for Health Brian Cowen refers the issue of vaccine trials on children in residential institutions to the Chief Medical Officer, Dr Jim Kiely, for the purpose of compiling a Report on the 1961, 1971 and 1973 trials (“the Vaccine Trials Report”). 2000 In January, Glaxo-Wellcome merges with Smith Kline Beecham to form GlaxoSmithKline. Newspaper reports of the merger, which is described as unlikely to result in job losses in Ireland, state that Smith Kline Beecham has two manufacturing plants in Ireland, one at Ringaskiddy, Co Cork and the other at Dungarvan, Co Waterford, employing more than 660 people, as well as a Dublin-based marketing and sales operation employing 130 people. Glaxo is described as employing 110 people in Ireland – packaging, sales and distribution and in drug testing. It is also stated that Glaxo has recently approached IDA Ireland for exploratory talks about establishing a manufacturing plant from which to serve the European market, although no definite proposal has yet been put forward. In November the Vaccine Trials Report is furnished to the Oireachtas. Little or no documentary evidence of the trials is available from Glaxo-Wellcome, the Department of Health or any of the residential institutions identified by the consultant who conducted the trials, Dr Irene Hillery. Mr Martin goes on to reassure the Dail that the trials appear to have had no medically negative consequences for any of the children. In fact, lack of documentation had made it impossible for Dr Kiely to reach a conclusion on this point, he did however reference in the Report possible negative consequences for the children concerned. The Government subsequently extends the terms of reference of the Commission to Inquire into Child Abuse (“the Child Abuse Commission”), to include the 1961, 1971 and 1973 trials, despite objections that the jurisdiction of the Commission, as set out in the Commission to Inquire into Child Abuse Act 2000, did not permit such a referral. 2001 GlaxoSmithKline announces that it will cut 104 jobs out of a total of 381 at its Dungarvan plant following a decision to transfer the manufacture of Sensodyne toothpaste to its Maidenhead operation in England, describing the move as part of a worldwide review of the group following the merger between Glaxo Wellcome and SmithKline Beecham. IDA Ireland and the Tanaiste, Mary Harney, are called on to create alternative employment in Dungarvan. 2003 With public hearings relating to the 1961 trial due to commence in June, the Child Abuse Commission issues a direction for the attendance of Professor Patrick Meenan, former head of the Department of Microbiology and Applied Medicine at UCD, who had been involved in the 1961 trial. In June, Mr Justice Smyth grants an application by the Commission for an enforcement order against Professor Meenan, stating that he was “a significant and important person” at the time and it was neither unfair nor unreasonable of the Commission to have described him as a central witness. Mr Justice Smyth notes that the Commission had invited Professor Meenan’s solicitors to apply publicly to exclude him on health and other grounds from giving evidence. In August, the Supreme Court allows Professor Meenan’s appeal, holding that requiring him to make a a public application to be excused is unreasonable and fails to show sufficient sensitivity to the very great effort participation in the public forum sought might represent to a man in his 87th year. The Court also expresses the view that the vaccine trials were not ‘abuse’ within the meaning of this term as used in the 2000 Act, raising questions as to the jurisdiction of the Child Abuse Commission to consider this issue. In September, Judge Mary Laffoy resigns as Chair of the Child Abuse Commission, accusing the Government of delaying and obstructing the inquiry. 2004: In Hillery v Minister for Education, Mr Justice O’Caoimh holds that the Commission has no jurisdiction to consider the question of vaccine trials, for the same reason as the Supreme Court in Meenan, namely that the vaccine trials are not ‘abuse’ within the meaning of the 2000 Act. However he states that there may be issues relating to the trials which could be the subject of an appropriate form of inquiry carried out by other machinery. 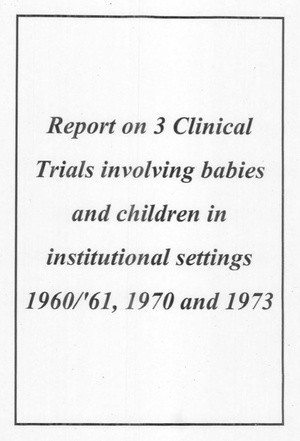 Meanwhile, the Interim Report of the Child Abuse Commission, published prior to the judgment in Hillery, references the receipt of documentation from Wellcome evidencing vaccine trials additional to the 1961-1971 and 1973 trials. 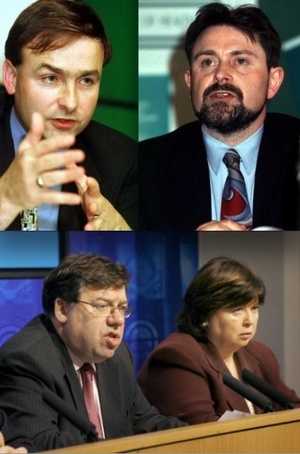 2005: Minister for Health, Mary Harney, announces that there is to be no further examination of vaccine trials, saying that this is not possible following the Meenan and Hillery decisions. However this assertion by Ms Harney conflicts with the dicta of Mr Justice O’Caoimh in Hillery above. 2006 It is announced that GlaxoSmithKline will part fund a EUR 13.7 million project at University College Cork on research into gastro-intestinal diseases. The project, which will create 50 jobs, is also tunded by IDA Ireland. Speaking at the launch in UCC, Minister for Enterprise, Trade and Employment Micheál Martin describes the project as a major breakthrough in the promotion of drug discovery research. Discussions commence between the Child Abuse Commission and the Department of Health regarding return of the documentation obtained by the Commission in the course of its inquiry into the vaccine trials. 2008: It is announced that GlaxoSmithKline is to create 50 new jobs with an €30m investment in the expansion of its existing over-the-counter (OTC) pharmaceutical manufacturing facility in Dungarvan, Co. Waterford. 2009: In November, it is announced that GlaxoSmithKline will close Stiefel Laboratories in Sligo, purchased by it in July, with the loss of 250 jobs. 2010 The Irish Independent reports that Mari Steed, a former resident of the Bessborough Mother and Baby home, is to take an action against Wellcome in the U.S. courts and against the Sacred Heart Order in the Irish courts. 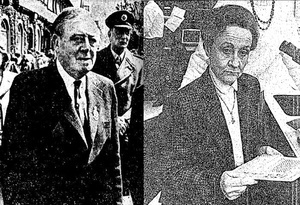 Further newspaper reports reference a number of additional victims, and additional vaccine trials, including John Barrett who alleges that unidentified tests were carried out on him at the Lota Industrial School, and Philip Delaney, the documented subject of a ‘five-in-one’ vaccine while in the care of Bessborough mother and baby home in 1965, above. GlaxoSmithKline neither confirms nor denies Mr Delaney’s assertion, and the Department of Health deny all knowledge of the ‘five-in-one’ trial. Meanwhile, documentation relating to the investigation into vaccine trials referred to by Brendan Howlin in 1993 cannot be found. It is unclear whether or not this documentation relates to the 1977-1984 Working Group or some other investigation. Following a formal request by Fine Gael health spokesman James, Reilly, the Joint Oireachtas Committee on Health and Children writes to the Department of Health, GlaxoSmithKline and other pharmaceutical firms asking them to hand over all files on vaccine trials carried out on children in residential institutions “as a matter of urgency” stating they may call for a formal investigation after a detailed examination of the files. 2011 GlaxoSmithKline confirms that it “continues to hold records relating to the Irish vaccine trials conducted by The Wellcome Foundation Limited and intends to do so for the foreseeable future” but refuses to hand these records over without a judicial order. The Department of Health states that all departmental records (except presumably those relating to the missing inquiry referenced by Brendan Howlin) are retained “in line with normal procedure”. It writes to the Child Abuse Commission stating that the Commission cannot hand over documentation to the Oireachtas committee or to participants since legally “it is not possible for that material to be used for any other purpose” other than … Commission investigations and that they should return all documentation to the source that originally provided it”. The Commission states that it is currently engaged in cataloging the documentation and has not commenced returning it. The HSE confirms that while it is to receive 15,000 adoption files from Bessborough, it “has been advised that immunisation records will continue to be the responsibility of the order”. The Sisters of the Sacred Heart at Bessborough say that their files are held in secure storage and they have “no intention” of destroying them. In July, GlaxoSmithKline announces that 150 workers at its Dungarvan plant are to be made redundant. 2012 In August, the Child Abuse Commission announces that it has commenced the return of material supplied to the Vaccine Trials division to its original sources. In October, GlaxoSmithKline reverses its decision to shut Stiefel Laboratories in Sligo, saving 120 jobs. 2014 In June, reports of a mass baby grave and evidence of high infant mortality at a mother and baby home in Tuam, Co Galway, reawaken public concern regarding treatment of children in care, bringing the vaccine trial issue once again to the forefront..
Dr Kevin McCoy, a former member of the Chlld Abuse Commission, and former Chief Inspector of the Inspectorate of Social Services in Northern Ireland, states that to his knowledge and belief Child Abuse Commission documentation relating to the vaccine trials has been retained and is to be housed in the National Archives for 75 years before limited access to it is allowed. Below is a link to a November 2000 report by the then Chief Medical Officer [Dr Jim Kiely] regarding trials conducted on children in mother and child homes. This is the report the Irish Times reported yesterday that the Department of Health is having difficulty tracking down. It concerns the state allowing Wellcome to carry out medical trials in care homes in the early 1960s up to 1973. The trials were overseen by Professor Patrick Meehan and Professor Irene Hillary both attached to the Medical Microbiology Department at University College Dublin. The report runs to a brisk, readable if ghoulish 45 pages and we highly recommend it should you have the time and an interest in these matters. The contents – known to at least four health ministers – reveal not just a cover-up (with laughable collective amnesia and no paper trail at all) but a reminder that certain medical professionals enjoyed playing god as much as the next nun. Anyone seen the secret vaccination files? “As Labour Health Minister in 1993, Brendan Howlin (above) assured victims that an inquiry had found they suffered no ill effects from the experimental medical tests. But last night mystery surrounded the whereabouts of the files relating to the inquiry — and Mr Howlin admitted he did not remember the probe or its findings. The Department of Health said it was searching department archives in a bid to locate the documents. “Until all the files are retrieved, the department cannot say if the results of the inquiry exist,” a spokesman said..
New documents reveal Mr Howlin’s private secretary told victims the minister was “satisfied” there was no risk to the children subjected to the trials in the 1960s and 1970s. This was based on an inquiry supposedly carried out by the Department of Health. How did Brendan Howlin know there was no risk to the children subjected to drug trials? High Court Justice Aindrias Ó Caoimh in his judgement [Hillery Vs Minister for Education 2004] quoting directly from the report of the Chief Medical Offcer put before Dail in 2000 .